In 1820, during the reign of George IV, a local grocer Thomas Fountain bought a plot of land measuring 15M x 10M in Green End St from a local farmer Henry Wells. 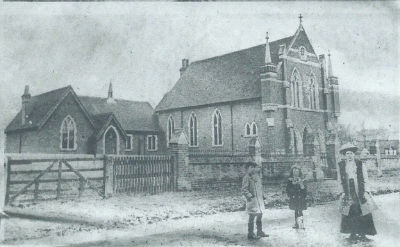 The purchase was funded by a group of ‘Protestant Dissenters’ who had been attending New Mill Baptist Church in Tring, and wished to plant a church in Aston Clinton (the regular walk to Tring was a bit onerous especially on a Sabbath day) Their first Pastor was Mr Thomas Amsden who had been a lay preacher, but took induction and became The Rev'd Amsden for 13 years. They built a timber meeting house (replaced in 1847 by a brick building which survived until 1897) when it was in turn replaced by a ‘brand new’ chapel. The original principals formed a trust subscribing 5 shillings (25p) each to contribute to Fountain’s purchase. ( * our archives include the original Deed of Trust signed by each one). 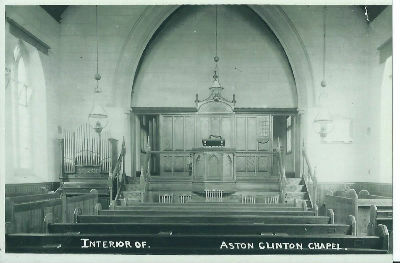 In the 1890s the chapel needed substantial repairs including replacement of the pews, but money was short. The leadership asked Mr Frederick Amsden (son of Thomas, then living in London) for a donation. 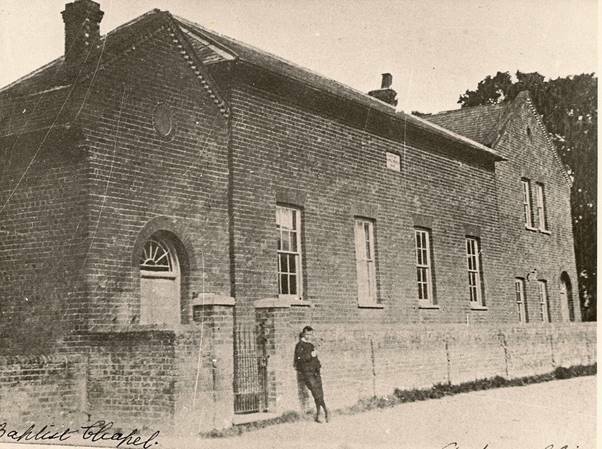 Fred took a look and said ‘demolish the lot and I’ll give £500!’ Further subscriptions were raised, a neighbouring plot donated by the Rothschild family and the new chapel and school room were built at a cost of £2143. In the early 1920s, it was noted the side walls were bulging outwards due to the roof weight. Buttresses and tie bars were fitted in 1923 at a cost of (£158/14/5½d = £158.72p). A further significant improvement was the installation of ‘the electric light’ in 1926 at a cost of £43. It seems to be past 1970 before any further significant changes, when plans were drawn up for our kitchen, lounge and Pastor’s office. At the same time, the Manse next door was built on part of the plot earlier donated by Rothschilds. The remaining corner as far as Chapel Close was sold for housing to pay for it all. The hall and ‘back rooms’ had no installed heating which made for substantial damp problems. In 1998 we wanted to install gas radiators at a cost of £11,000. While puzzling over how to raise the money, we were advised of a bequest of £10,000 from a person who used to attend, but had not been back for many years. We chose to believe God was in that matter somewhere! In 2003, our chapel was recognised to be in a pretty dire state and ‘run down’. Proposals were drawn up to substantially remodel the place, including removal of several old furnishings (pulpit – never used, choir stall – no choir, and the organ and partition – not needed). We replaced all the electrics, fitted new central heating radiators, laid a new floor over the old wood block, and repainted the whole place, thanks to our then Minister who had been a professional housepainter, and a group of dedicated Fellowship. We even removed the old wartime blackout curtains – no longer needed!). The cost was estimated to be £43,000. We raised £30,000 by a Gift Day in one weekend, for which we were heartily thankful to our Lord who seemed to approve of our efforts! We went digital in 2005, installing a proper screen and computer driven projector. And that is where we are today – with continuing efforts to keep the church in good order and vibrant in nature. 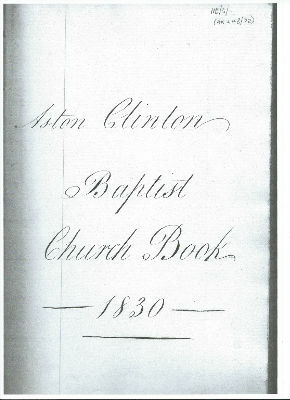 Church minute book in 1830.